I recently had the pleasure of reviewing some lessons by Annie Keupp of AHST in Avoca, Iowa. She teaches music and I was so excited to look at CRISS through her lens. 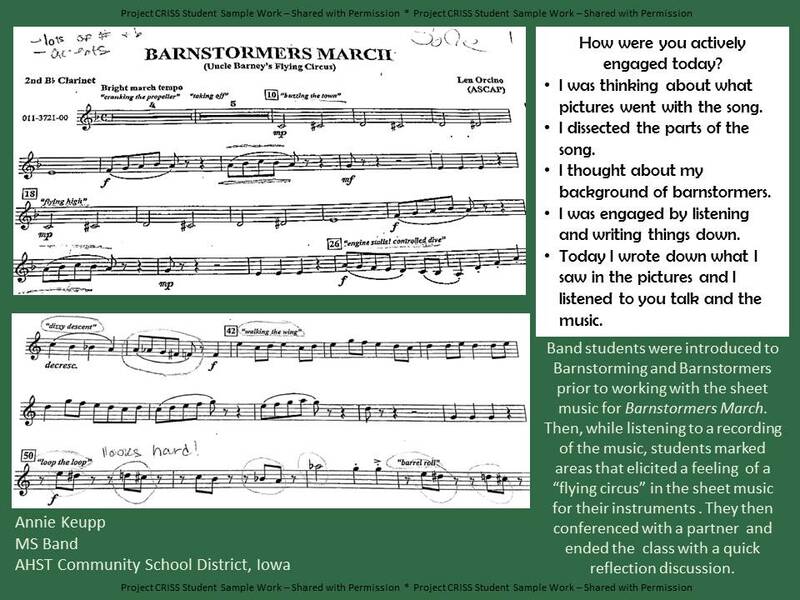 You can see below samples and summaries of the lessons she submitted along with some student work. Lesson 1 (left) used sheet music, margin notes, and reflection. Lesson 2 (right) had students comparing different roles in opera productions. Great selection of strategies to support the learning goals but of course I’m most pleased to see the reflections. Notice how they were nice and general - the students talked about how the activities helped them remember, allowed them to share, they got to discuss and learn from others. It’s NOT that they learned more about reading music or how the lighting on stage works. It’s important to reflect on content learning goals (of course! You should assess the heck outta content knowledge!) but by reflecting on the process – the how of learning – you build metacognition and resilience by helping students see the transferable skills they just developed. Psychologists have known for a while that memory works best when the context during testing matches the context during learning; this is an example of what is called the encoding specificity principle. The doorway effect suggests that there's more to the remembering than just what you paid attention to, when it happened, and how hard you tried. Instead, some forms of memory seem to be optimized to keep information ready-to-hand until its shelf life expires, and then purge that information in favor of new stuff. Reflection on the HOW of learning – not tied to the content – helps add context to the lesson. 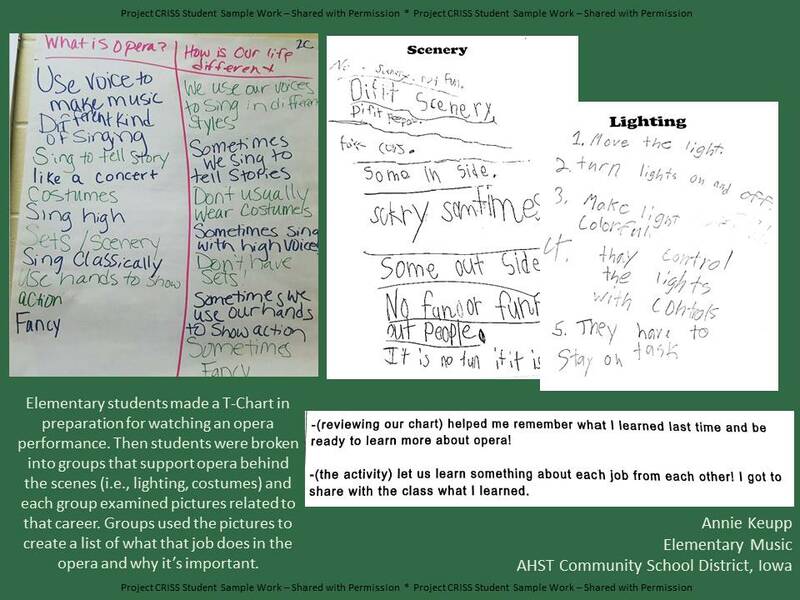 In lesson 1, students reflected on how they were actively engaged. Think they ever get bored in any other classes? Of course. NOW perhaps some of the students might stop and say “You know.. maybe I should think about pictures that go along with [content that is boring them].” Or “I should think about my background with [content they just don’t care about].” Students will still deal with physical doorways and they’ll still need prompts to make connections to other classes but as they reflect more, they’ll extend the shelf life of the memories of learning experiences (the strategies, the struggle, the framework they use). That information will be closer to the ready and less likely to be purged. Great lessons, Annie! Thank you for your dedication to students!